This Multigram PAMP Suisse 1 gr. Gold Bar is the latest innovative release from the well-known refinery ­ PAMP Suisse. This 1-gram Lady Fortuna bar is struck of .9999 fine gold and is the most popular gold bullion item produced by PAMP Suisse. This stunning bar is offered in its Certi-PAMP unit, detached from the Multigram PAMP Suisse 25x1 gr. Portfolio Gold Bars. One of the prominent bullion leaders in the world, PAMP Suisse, was established in 1977 in Switzerland. Since then, the refinery quickly became popular among investors and collectors. 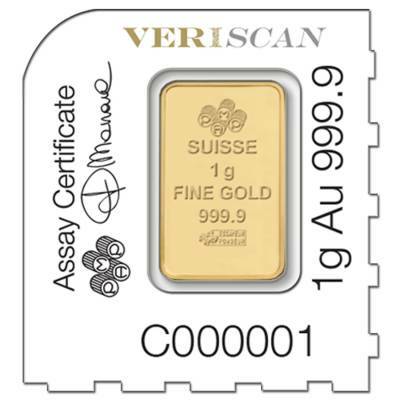 It’s the first bullion producer that incorporated the anti-counterfeit holographic feature for its bullion products. The Lady Fortuna gold bar is the most famous precious metal item produced by PAMP Suisse, being highly appreciated due to its stunning obverse design depicting the Roman Goddess of luck. She is engraved as sharing her cornucopia of riches with others – the symbol of welfare and prosperity. This detached ingot unit is part of the Multigram PAMP Suisse 25x1 gr. Portfolio Gold Bars. 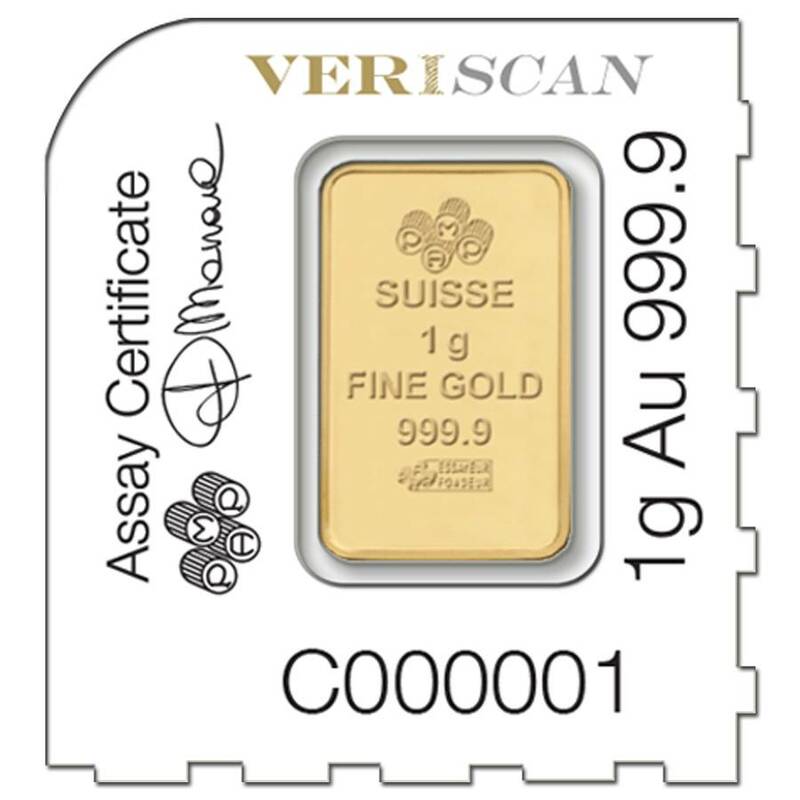 The bar’s mini assay card contains the signature of the assayer, its unique serial number and the certification of its purity and weight. This Multigram PAMP Suisse 1 gr. Gold Bar is a great gift for any special occasion, a cost-effective addition for bullion enthusiasts and an excellent way to diversify your investment portfolio. Lady Fortuna gold bar made of 1 gram of .9999 fine gold. Detached from the sheet of 25 Multigram PAMP Suisse Portfolio Bars. Sold in its individual tamper-evident Certi-PAMP assay card. Displays the unique serial number and is IRA-Eligible. 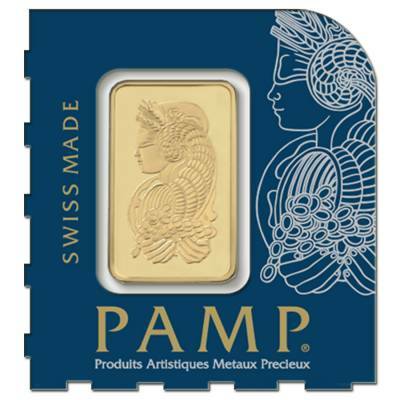 Weight and purity guaranteed by PAMP Suisse. Contains the newest Veriscan® anti-counterfeit security feature used to authenticate each bar - the microscopic surface topography. This individual digital fingerprint is uniquely assigned to the bar and registered in the company’s special catalog. Obverse: Showcases the stunning image of ‘Lady Luck’ ­ Lady Fortuna, the Roman Goddess of luck and fortune, as well as the protector of grain supplies. She is depicted with a blindfold on her eyes, which symbolizes the unpredictability of life. The Goddess holds the cornucopia in her hands, generously sharing its overflowing wealth with others. Reverse: Contains the PAMP Suisse logo, followed by the purity and weight marks. On the reverse side of the bar is also engraved the “Essayeur Fondeur” inscription which confirms the bar’s authenticity. A cost-effective acquisition - carries smaller premiums than a gold coin. Excellent opportunity to diversify your collectibles portfolio. A great gift option for special occasions, symbolizing luck and welfare. Simple to be counted, stored or resold. Backed by a bullion leader - PAMP Suisse. 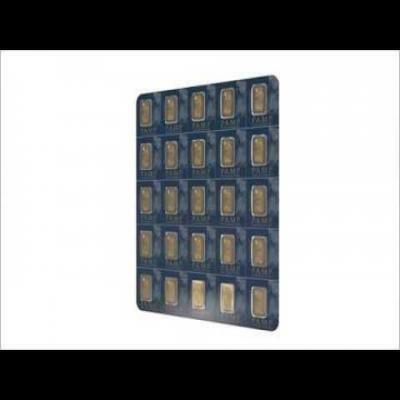 If you are searching for the best place to buy high-quality gold bars - you found it! Here, at Bullion Exchanges, we offer you only 100% authentic bullion products. 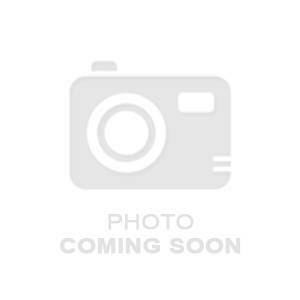 Add this Multigram PAMP Suisse 1 gr. Gold Bar to your precious investment portfolio. Click on ‘Add to cart’ and we guarantee that your bar will be wrapped and packaged to be securely delivered to you! If you have any questions, just contact us at 800.852.6884 or send us a message, and we will be happy to assist you. My PAMP Suisse gold bar arrived quick and well packaged. Bullionexchanges has great customer service. I have already recommended them to a number of people. I love that PAMP bars come in a variety of sizes, it makes it feasible to purchase physical gold. As with all of my purchases with Bullion Exchanges, my order arrived quickly and in great condition. I highly recommend shopping with Bullion Exchanges! With this purchase, you earn 52 Bullionaire Bucks 52 BB = $0.05. We currently have 339 of this item in stock. For every $1 spend, you will earn 1 Bullionaire Buck which is equivalent to $0.001 off a future purchase. 52 BB = $0.05.